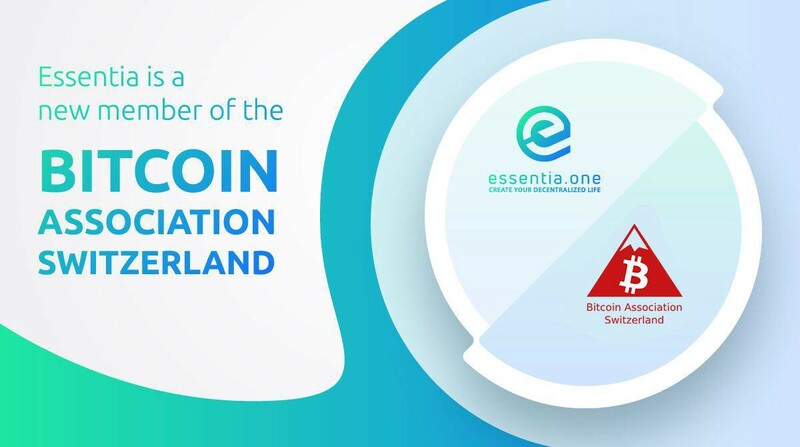 Essentia, the decentralized framework to create, store and access your digital life, is thrilled to be a part of the amazing Bitcoin Association Switzerland. We’re always here to support Bitcoin adoption, education, and development. The world of cryptocurrency is growing up really fast so keeping all of the enthusiasts together is priceless. What is The Bitcoin Association Switzerland? In their own words: “The Bitcoin Association Switzerland is one of the oldest and most active non-profit associations around the topic of Bitcoin and other cryptocurrencies. They have been organizing free social and educational events with the number of attendees ranging from a humble dozen to several hundred. They have been assisting in the resolvement of legal issues and lawmaking, and educate the broader public by providing a contact point for media inquiries as well as face to face with anyone interested at our regular meetups”. Why is Essentia now a member of Bitcoin Association Switzerland? Essentia is very keen on the idea of getting to hear a wide range of opinions from every member. No one is left behind. This is one of the major reasons why we decided to join the Bitcoin Association Switzerland. We also want to have our say. Essentia implements the same inclusive strategy with the development of our framework to attain the best results possible. Another key reason why we’re now a member of the Bitcoin Association Switzerland is to help raise cryptocurrency awareness around the globe. Why is it important to spread the word about cryptos? Everybody knows about Bitcoin. Well, everybody’s heard of it. But do we really know about blockchain technology? How is it evolving, why is it going to change the world and what is its use cases? Bitcoin Association Switzerland holds various meetups and conferences on the topic. World conferences help us to get the hang of the today’s realities and to keep up with the times. It’s a great opportunity to share your own thoughts and listen to what experts in the field have to say. Our community is very enthusiastic about learning the political, technological, business and legal aspects of cryptocurrency. Bitcoin Association Switzerland is giving you an opportunity to meet with the best speakers possible, covering many areas within and around Bitcoin. To get more updates on future partnership and sponsorship, join us on our social media.